SCOTT ARFORD (b. 1967) has been active in the Bay Area's underground music and art scene since 1995. His work constantly strives to create an undeniable ecstatic moment, where sound, image and environment merge into a singular experience. 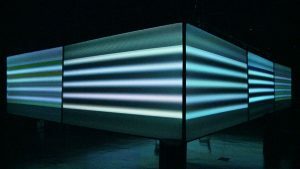 His Static Room and TV­IV projects create intense flickering static environments using images to create sound and sounds to create images. Works created for Naut Humon's Cinechamber expand these projects into multi­channel video and sound installations. His Infrasound collaboration with Randy Yau, activates architectural space with sound, literally causing buildings to shake and vibrate. Arford has shown work globally including the San Francisco Museum of Modern Art, the Sounding Festivals in Guangzhou, China and Taipei, Taiwan, Liquid Architecture in Melbourne, Australia, Sonic Light in Amsterdam, and the Center for Contemporary Arts in Kitakyushu, Japan. 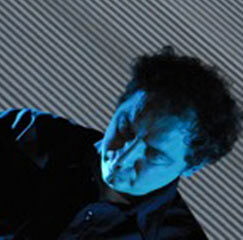 His awards include an Honorable Mention in the 2005 Prix Ars Electronica. Arford received a Bachelor of Architecture from the College of Architecture and Design at Kansas State University in 1991. He currently works at EHDD where he just competed a 14 story campus building for City College in downtown San Francisco. The RML Static Room modules are segments from Scott's ongoing series of performance & exhibitions, which with the palpitating chromatic moiré patterns from TV static and flawed connections, omit all representational images and cease to portray a linearly composed narrative event. Clamorous tones and hallucinatory color fields break down into vibrating sheets of interlaced fluttering and tumultuous shredding crackling luminosities that make it possible to hear the buzzing images and see the flickering sounds.